Bought new in September 1998. This car was a hoot. Whilst it only had 50hp from it's 800cc three cylinder engine it managed to keep up with traffic, and it's size meant that you could thread thought traffic very easily. The specification was impressive: Power Steering, Two Air Bags, Central Locking, Electric Windows, Air Conditioning, Immobiliser etc. Of course being a Daewoo it had three years (or 60,000 miles) of free servicing along with a three year warranty, so I didn't have to pay a penny to the garage for three years. The car covered 40000 miles. Build quality was good. There were a few rattles from the B-pillars which were tracked down under warranty, but otherwise build quality seemed to be excellent, with the doors having a very Volkswagen like clunk when you closed them. Other work that was done included a repair to a seat-belt reel that was not working properly, kinked pipes in the air-con system and a new door seal to cut down wind noise. After 2 years the alloy wheels started to corrode, so Daewoo replaced them! 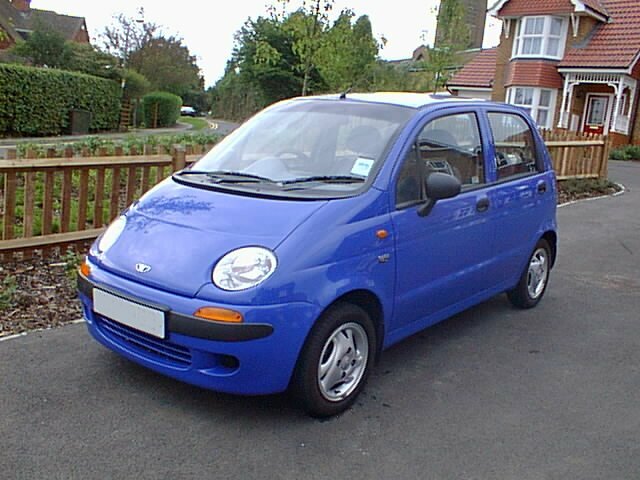 Okay, the Matiz was hardly a prestige car. However, a few magazines and TV programmes said that they rated the car highly, and I think that they are right. Residual values were a concern with Daewoo cars. The original Espero and Nexia were awful. The Nubira and Leganza aren't much better, but the Matiz was better. Sold after three and a half years for £3500.